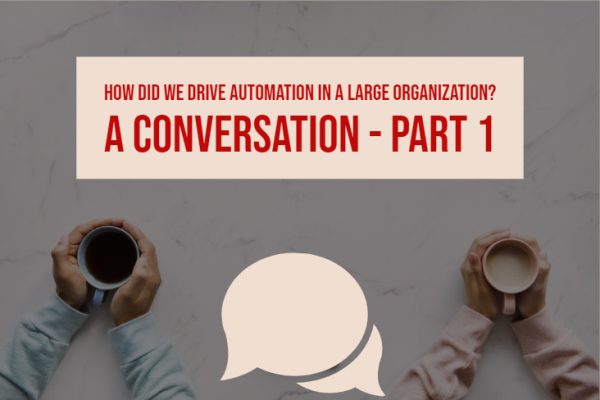 This conversation takes place between three (fictional) professionals in ACME Inc; a large organization committed to making automation a strategic choice. The people involved from ACME are Rob, Senior Manager – IT Automation, Sara, Senior Director of Business Automation and Digital Transformation and Jake who is a Product VP from their robotic process automation vendor. It’s been 2 years since Sara was hired to spearhead automation in ACME. Now that they’ve deployed robotic process automation bots in a couple of business processes and have shown success, the company has decided to start rolling bots out to other departments in the company. They get together to talk to a group of department heads in their company to explain what’s been happening on the automation front in their company. Jake: Let me introduce what the agenda is. Today, we will be covering a very exciting RPA success story and one of our largest customers, I will introduce them in just a moment, we will also be talking about why robotic process automation, why RPA, and we will be making a case for that, especially in an enterprise environment. We will discuss some implementation best practices. This is an important piece, of course, for those of us who implement RPA in very large enterprise environments. So we certainly have a very exciting story that has been a success story for a while now and brings a lot of best practices and potential pitfalls to look out for. We will be going through real life use cases today which are right now in production. Sara, would you mind walking us quickly through the results you’ve seen? Sara: Thank you Jake. I’m very excited to be here to share our journey on RPA and automation. And with me, we have Rob. Together, we’re going to share our story at ACME and how we have achieved these results. So you see the big number out there, we have saved about 45,000 hours and counting each and every day. And all these savings came through different functional areas where we prove automation in order management, testing, renewals, finance. But before we get there, I wanted to share how we started and where we started our journey with robotic process automation. So my role specifically is around my Digital transformation team. And I support sales, marketing channels and business operations. Given the nature of it, it’s only natural for us to think automation day in and day out. We have to drive operational excellence. We have to try to start doing more, with not necessary less, but more with what we already have. So it’s extremely important for us to think outside the box. So with that let us explore the robotic automation the domain back in 2017 fall of 2017. So we looked into various solution providers, and chose one of them. Since then we have come a long way in a little over a year and have achieved tremendous success. We’ll go through some of our lessons learned, our findings and structure. But before we do that, I would love to have Jake share with us what robotic process automation really is and then we’ll go into the details of our process. Jake: Thank you, Sara. And I know that we will go back and see exactly where robotic process automation has been a value add. But before we get into that, let’s quickly touch on exactly what is RPA and how it is implemented and how the technology is used to automate various processes right at the surface level and at a very high level. Robotic process automation today, is this technology that helps you automate day to day repetitive tasks better. So whether those are you know, you’re doing invoicing on a day to day basis or you’re doing data entry. For example, starting from simple ones all the way to highly complex processes; end to end processes; encompasses the spectrum of RPA. What is robotic process automation? It is a bunch of configurations that automate manual repeatable tasks. We also include Machine Learning algorithms that solve specific problems. For example, automation engineers can use a bot which is an AI driven product and it’s a purpose built cognitive automation product. It brings these techniques to complex document processing. So, algorithms that solve specific problems. Also software robots (bots) that plug into an existing business software; this refers to your day to day enterprise infrastructure elements such as your SAP, Oracle, your CRM systems, your HR systems, etc. We walk into the offices in the morning, we login to those systems to do our day to day work. These bots help us do our tasks automatically. Last but not the least, we are really working to enable interaction. There are many layers to this. So for example RPA includes attended automation, where events, prompts, and more triggers; be it human or machine generated can kick off processes. Attended automation would be something like using automation in a call center environment, and you call into an insurance agency, for example, and you want to add motorcycle insurance to your home insurance. When you’re talking to the CSR, the customer support representative who’s on the call with you, as they are taking input from you and they are entering that input into a form, there could be an attended bot running there that can take that input log into Salesforce and pull the information back and show it on screen. And a few steps down, it can also kick off a back end process. This would be typically referred to as unattended automation. With AI being infused to our platform bots can use machine learning techniques and cognitive capabilities to a robotic process automation. The spectrum is constantly expanding in terms of which processes and functions can be automated, rules based decision making, data driven system navigation, so on and so forth. So today, I think it would be wrong to say that robotic process automation technology is still in its early stages, in terms of large enterprises making use of it, there’s a long way to go in automating all of our processes. And this is why we have all seen RPA really take off in the last 12 months, even though some robotic process automation tools firms have been at it for 15 plus years. So we’ve seen the evolution of that, we have developed to meet the needs and now that robotic process automation has become this rocket ship, we feel that the technology is finally enterprise ready. Now, with that overview of RPA, let’s look at what are some of the motivators to why would you want to implement robotic process automation at the very high level. Rob, would you like to describe why ACME went with RPA? Rob: Well look at it like this. ACME has gotten value out of what they invested in terms of 45,000 hours added capacity in over a year’s time. That’s a lot of productivity gains. What this means at a very basic level is, if you want to maybe even 10, 20 or 30% of your day to day tasks using software bots provided by us and multiply that by 10s of thousands of employees in a in an enterprise, the productivity equation becomes very simple. Consistent performance the same way each and every time. And if you combine that with accuracy, which is no errors. Bots don’t make errors unless you ask it to. For example, the genesis of automation is testing automation software where QA testing today uses a lot of robots. Robots, this is where you would specifically code to do a letter on keystroke because you want to test that action. But other than that, the bot will do exactly what you asked to do. So one big point of robotic process automation is that it reduces and often removes completely the human error. The reliability of being able to run a 24×7 RPA is an ideal case for a lights out operation. And many of our very large customers use it in lights out, mission critical cases. Last but not the least, compliance security for government regulations. To control the audit capability, the audit trail and the compliance regulations that is built into the robotic process automation platform is exactly the reason why good enterprises choose automation systems. In an enterprise environment, compliance audit capability and all the elements that I just mentioned are super critical. Jake: We have banking, finance, financial services, insurance, industries where RPA has probably gotten the most penetration. This is the reason is that these platforms are compliance compatible. Enterprise platform has to have built in security, control and audit capability. Without those any platform that does not include these as part of the system cannot be production ready. And with that, I will hand it over back to Sara. And if you could walk us through your processes today and how hard it was to automate and touch upon the big question; what can be automated and what should be automated. Will be continued in Part 2.